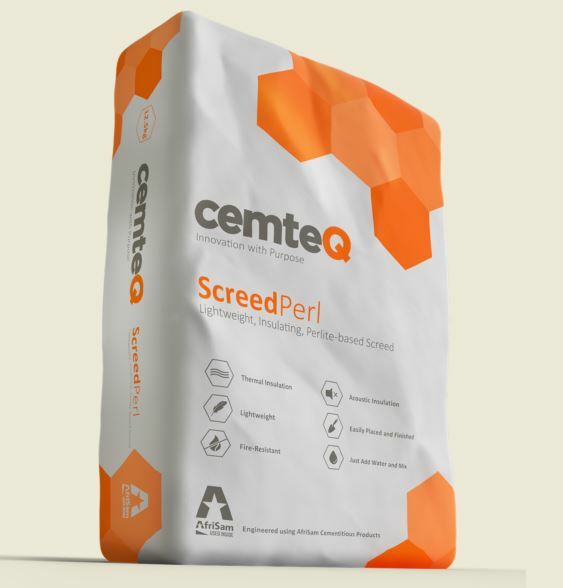 CemteQ has introduced a new range of cement composite products that use Perlite as an aggregate replacement, together with cement and special admixtures for tailored plaster, screed and concrete applications. Thanks to the Perlite component, these products all comprise significant insulation, fire-resistance, lightweight and acoustic properties. PlasterLite is a super-smooth, easy-to-apply composite material for trowel-on plaster and low-velocity pumped plaster applications, available in white and grey. It combines exfoliated Perlite with high-quality cement, admixtures and micro fibres to create a unique one-coat plaster solution which doesn’t require a skim plaster. It offers approximately six to eight times the insulation properties of ordinary plaster with an R-value of 0,128m².K/W for PlasterLite white and 0,156m².K/W for the grey option, compared to about 0,019m².K/W for 15mm ordinary plaster. PlasterLite also only weighs between 25-30% of traditional plaster. ScreedPerl is designed to prevent downward heat loss in floors with underfloor heating, but also provides a lightweight, insulating solution for roofs. It can be applied to uneven or curved surfaces with a suitable bonding agent, and can easily be sloped towards drainage points or to the roof edge to facilitate water run-off and prevent damage. Compared to an R-value of 0,042m².K/W for a 30mm floor screed using traditional materials, ScreedPerl boasts an R-value of 0,316m².K/W, approximately 7,5 times the insulation of ordinary plaster. And with an installed weight of between 460-470kg/m³, it equates to roughly 20% of the weight of traditional screed material. The product, however, is not suitable for high-wear areas and must be covered with a floor covering such as carpets, wood or tiles. It is also not waterproof and must be covered with a suitable waterproofing system when used on roof decks. CemteQ’s Perlite-based products offer excellent fire protection for up to four hours. They have low linear expansion characteristics which reduce the development of cracks, ensuring that the temperature of the structure and load-bearing members is maintained below the critical point at which weakening or failure is likely to occur. They release no smoke or toxic gas, and do not disintegrate or spall when cooled suddenly with a firehose. The products further provide efficient sound dampening, particularly for pulsed sounds, and they are inorganic – therefore they do not rot or decay over time. ScreedPerl is designed to prevent downward heat loss in floors with underfloor heating, but also provides a lightweight, insulating solution for roofs.